If Mohamed Nasheed, former President of the Maldives, had been a cat. he would have used up his nine lives by now. Speaking at the School of Oriental and African Studies in London, Nasheed said he had almost lost count of the number of times he has been in prison, he thought it was about 14 times. Nasheed’s current spell of exile has come to an end with the unexpected defeat on September 23 of the government of Yameen Gayoom which had dissolved parliament and the supreme court using military force and imprisoned all political opposition leaders. Nasheed is free once again to return home and play a role in the new government. Nasheed said: “Much of my life seems to have been a revolving door between political office, jail, exile in the UK, and return. We exposed abuses at home and got accountants to uncover Yameen’s abuses and corruption.” In January, Yameen’s troops stormed the Supreme Court and abducted the Chief Justice, dragging him along the floor by his tie. Street gangs were unleashed on opposition activists and supporters. Despite these excesses, the opposition united behind the leader of the Maldivian Democratic Party. As a result, in the September election, Yameen, who had thought he would have an easy win, lost by a landslide. The opposition united behind the MDP leader. For Nasheed, this has been a familiar pattern. Often called the “Mandela of the Maldives,” Mohamed Nasheed remains a champion for the promotion of human rights and democracy in Islamic countries and an international icon for climate action. 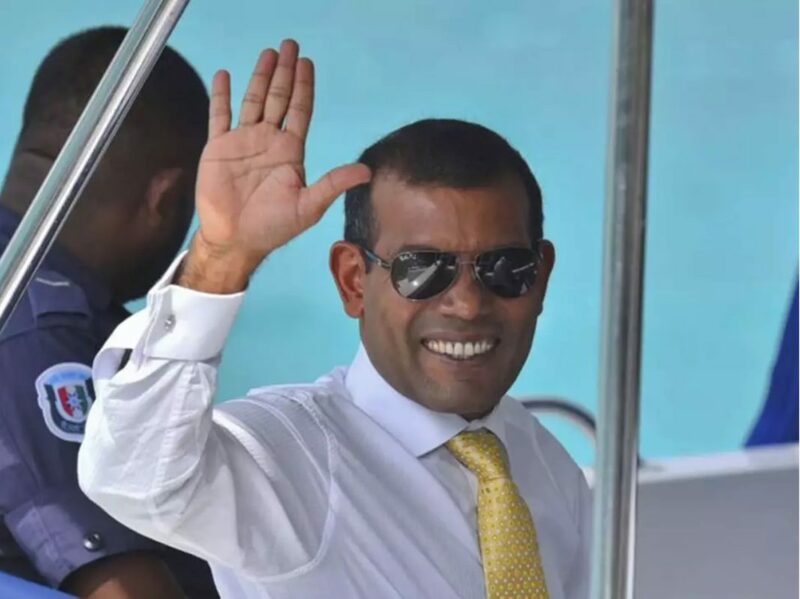 A former journalist and human rights activist, Nasheed led a campaign of non-violent civil disobedience against Asia’s longest-serving ruler that resulted in his arrest, imprisonment, and torture for his political beliefs. Through years of peaceful political activism, he succeeded in pressuring the dictatorial Maumoon Gayoom to allow political pluralism and, following 2008’s historic free and fair elections, Nasheed was elected president, sweeping away 30 years of one-man rule. As Nasheed and his supporters describe it, this budding of democracy was quashed in 2012 by a coup d’etat involving anti-democratic elements, loyal to the previous dictatorship, within the military and police. Nasheed was subsequently sentenced to a 13-year prison sentence, which was denounced around the world as a transparent maneuver to prevent him from challenging the Beijing-backed regime of Yameen Gayoom in upcoming polls. Living in exile between Colombo, Sri Lanka, and London, Nasheed led opposition efforts that included building a multi-party coalition, coordinating nationwide grassroots activism, global media engagement, and international diplomatic measures. Nasheed recalls that in the years when Gayoom had been in power, there was no hope of building an opposition party in the Maldives. Every attempt invariably led to jail and torture. The only way he was able to mount an effective opposition campaign was by slipping out of the country and marshaling support from abroad. It is characteristic of the tangled nature of politics in the Maldives that Nasheed has joined forces with his former oppressor, Maumoon Gayoom, who was imprisoned by his half-brother, Yameen. Not easy to follow if you are not familiar with the country. Nasheed is often asked what it is like to live in exile. He says that in his case he did not wish to be in the UK and would rather be home. “You yearn for your home. and you are reminded about it all the time. … For me, home is always in you ,and you carry it around.” He thanked the UK for its support, but said the sun was shining in his country again, and it was time for him to go back. Nasheed acknowledged that given the history of the Maldives, nothing could be taken for granted; there were challenges and threats ahead. He said the priorities of the new government on domestic policy would be judicial reform and environmental protection. Foreign policy, he said, will be shaped by the Maldives’ national interest, and the country will strive to balance links with China and India. Referring to concerns that China’s intention was to use the Maldives as a base in the Indian Ocean, Nasheed commented that this was a wider problem not just restricted to the Maldives. There have been ongoing worries about radical Islam gaining a foothold in the Maldives under the Yameen government. Some 200 fighters had traveled from the Maldives to fight in Syria. This has naturally led to fears that religious extremists will tighten their grip when these fighters return. Nasheed gave an assurance that the new President would not allow this to happen. Nasheed made encouraging statements about removing restrictions on human rights, freedom of speech, and other repressive measures introduced by the Yameen government. He also said that the Maldives would like to rejoin the Commonwealth. Nasheed had been disappointed in the past at what he saw as the Commonwealth’s lack of support when he was forced to step down in 2012. He said he was hopeful that this time the Commonwealth would implement its commitments. During his time in office and after, Nasheed played a prominent global role in advocating for climate action. To highlight the Maldives’ vulnerability to rising sea levels, he famously held a meeting of his cabinet underwater. As a detained activist, Nasheed was named an Amnesty International “Prisoner of Conscience,” and subsequently, Newsweek called him one of the “World’s 10 Best Leaders.” Time magazine declared President Nasheed a “Hero of the Environment,” and the United Nations has presented him with the “Champions of the Earth” award. In 2012, following the “coup,” Nasheed was awarded the prestigious James Lawson Award for non-violent political action. In 2014, Nasheed was elected the President of the Maldivian Democratic Party. This month, he announced plans to return home to the Maldives after living in exile for two-and-a-half years following the landslide electoral victory of his party and the defeat of the regime that deposed and imprisoned him. Nasheed sees himself as living proof that it is possible to keep the spirit of democracy alive from exile. He says the Maldives is a case study of the challenges in surmounting the old guard residing within young democracies and maintaining national sovereignty amid the escalating geopolitical competition in the Indian Ocean region. Hopefully, when Nasheed returns to the Maldives, this time he will be there for the long term. How a Georgian journalist sees UNWTO nominee Zurab Pololikashvili for Secretary General?